The 4,865-foot Whiteface Mountain, New York state's fifth highest peak, is an Adirondack landmark that's difficult to miss. The enormous landmass rises some 10 miles north of most of the other High Peaks — Adirondack mountains higher than 4,000 feet — so its distinctly sharp profile is uncluttered by neighboring peaks. 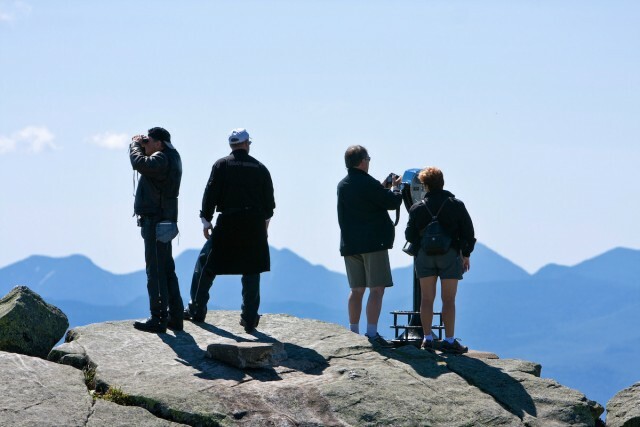 That means the 360-degree view from Whiteface's large, rocky summit is a sweeping panorama of wilderness, lakes, and serrated ridgelines that fade to purple as they approach the horizon. Whiteface is not only one of the highest mountains in the Adirondacks, it's also the most user friendly. It's the only High Peak that doubles as a ski and snowboard resort, and it's also the only High Peak with a gondola, road, and elevator. That level of accessibility makes it the perfect destination for anyone seeking a superb view. My favorite way to see Whiteface is by foot. Bushwhacking aside, there are a couple of paths up the mountain, and none of them are easy. The shortest route is from the Atmospheric Science Research Center. To get to the trailhead, simply turn onto Route 431 (Whiteface Mountain Road) at the four-way intersection in Wilmington and follow it for 2.4 miles. Turn left on Atmospheric Science Research Center Road and follow it around the one-way roundabout. The trail isn't marked but you'll see it on the right, just past a dirt road. The path dips down before beginning the steep, 3.9-mile hike to the summit. Along the way you'll also reach the summit of Marble Mountain and pass the unmaintained herd path to Esther, the northernmost High Peak. If you're feeling energetic, follow that for about a mile to nab a second High Peak. Just be aware that this trail is not as clear of obstacles as the main path, so it's likely to have sections of rough footing and extensive mud. If you want a longer hike with less steep climbing, turn left onto Reservoir Road, about 0.5 mile after the four-way intersection in Wilmington, and follow it to the trailhead. This route is almost 2 miles longer, but it travels easily through a nice, open forest before climbing steeply up Marble and joining the previous trail. For a longer, out-of-the-way attack on Whiteface, take Route 86 toward Lake Placid and park at the Whiteface/Connery Pond trailhead on the right. You can also drive down the dirt road and park in one of the designated areas, just be sure to respect the rights of private property owners. After parking, you'll follow an old dirt road past a yellow gate, around part of Connery Pond, and on to Lake Placid lake, where there's a dock and a prime swimming spot at Whiteface Landing. Turn right to begin the ascent to Whiteface's summit, which is reached about 6 miles after the parking area. The gondola doesn't go to the top of the big mountain, but it does bring riders to the 3,678-foot peak of Little Whiteface. Yes, it's about 1,000 feet shorter, but the views are still enormous — you'll find youself looking up at Whiteface's rocky summit cone and enjoying expansive vistas from the large, wooden viewing deck. To catch a ride, enter the main ski center lodge from the parking area, buy a ticket at the counter, and continue out the other side of the building to reach the loading area. Hop on, sit back, and enjoy watching the view open up from the comfort of the gondola. Relaxing while ascending? That's a rare treat in the mountains! The most accessible way to get on top of Whiteface is to drive up the Whiteface Mountain Veterans Memorial Highway. The views open up almost immediately after the toll booth and only get better as you navigate the 8-mile road to the parking area that's just below the summit. 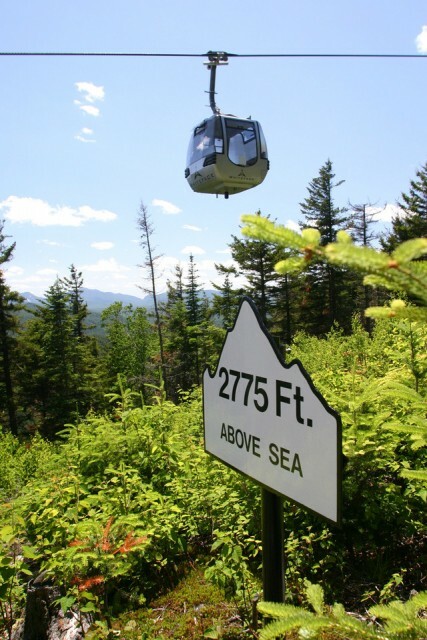 There are two options from the lot: Follow the tunnel and ride the elevator to the summit, or hike along the mountain's dramatic ridge via a steep stone staircase. The elevator is accessible to people of all abilities, and the staircase is better suited for people who want to get their legs burning before the big view. The highway is also a favorite of cyclists, so drive carefully! Whichever way you decide to ascend Whiteface, bring something warm to wear at the summit. It can be chilly at 4,865 feet, even on a hot summer day. If you're looking for a fast way to get down the mountain, check out this blog on downhill biking the mountain in the summer. While in Wilmington, fuel up at one of our local restaurants, and book a room to turn your adventure into a vacation!